Users can enter data on either the percent of breast screening patients using a service or the number of services in order to customize the table to their practice. This feature is explained and discussed below. Users must include at least one service in addition to screening mammography in order to create a bundle. 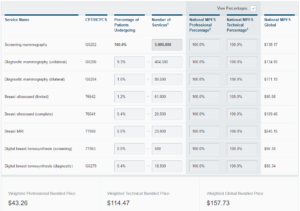 However, users do not have to include all seven services in the bundle they offer; in this case, the Percentage of Patients Undergoing and the Number of Services associated with that service would be zero. The values in the Percentage of Patients Undergoing column do not need to sum to 100% as these percentages reflect the percent of patients using this service in addition to the primary service of screening mammography. Not all patients will use the additional services but the bundled payment will be a single payment that distributes the cost of all services utilized across all patients. Users can adjust the percentages associated with a service. This will update the number of patients receiving a service based off the total number of screening mammography services. Users can also manually change the number of patients receiving a service, which will change the percentage associated with that service. 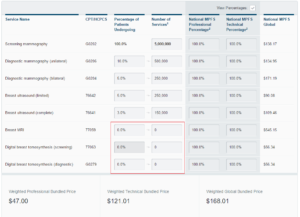 Changing the percentages or number of services will not affect data in the price columns, but will update the bundled payment at the bottom of the table. Note that the Percentage of Patients Undergoing associated with any service cannot be greater than 100%, and the Number of Services associated with any service cannot be greater than the number of services for screening mammography. Attempting to enter percentages or numbers greater than the total will result in error messages. Here we change the total number of screening mammography services to 5,000,000. After changing any value in the table, ensure you have hit the Enter key so the bundled payment will update at the bottom of the table. After updating the number of screening mammography services, the number of services for each additional service also updates based on the percentages in the column for the Percentage of Patients Undergoing. 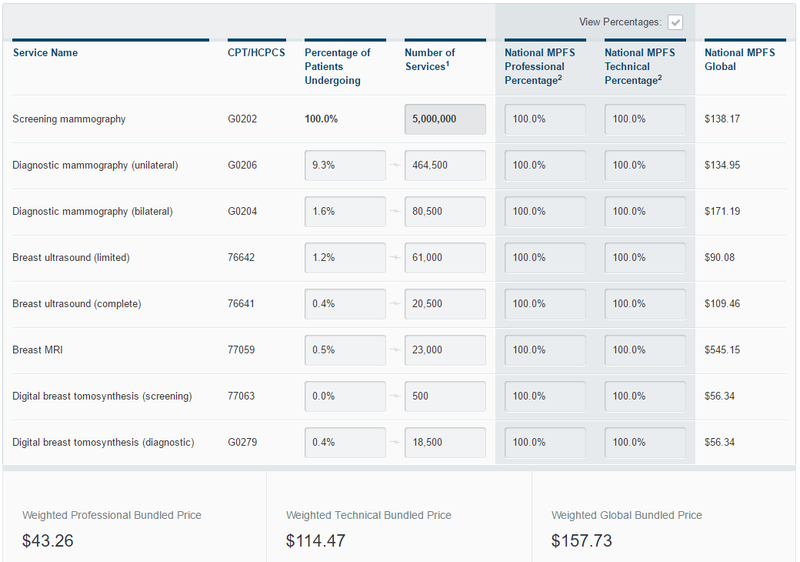 Next we’ll change the percentage values associated with all of the additional services. 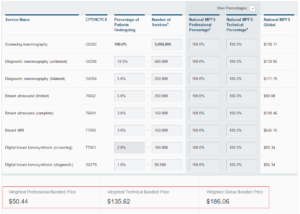 Note that the bundled payment displayed at the bottom of the table has changed from $43.26 per patient to $50.44 per patient. 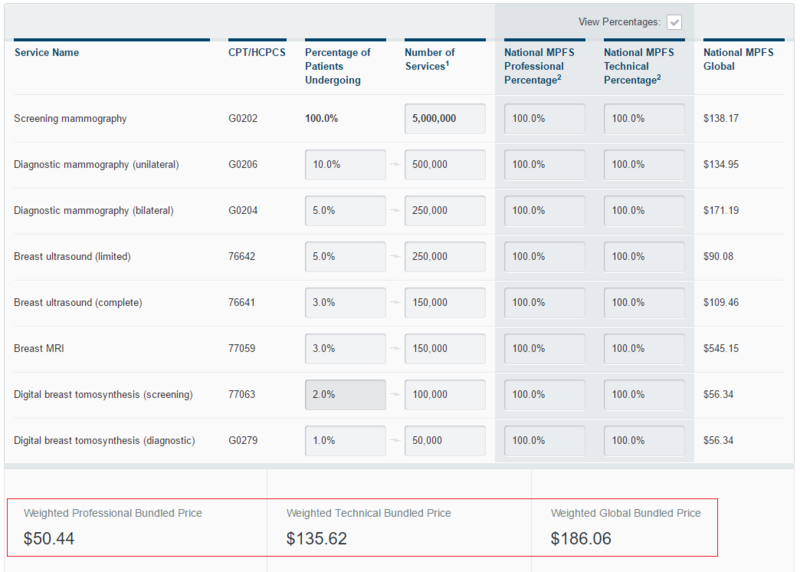 The bundled payments at the bottom of the table will update with each change to the percentage or number of additional services. So far, the bundled payment in the table includes all the services in the bundle. Now let’s change the bundle to include only diagnostic mammography (unilateral), diagnostic mammography (bilateral); breast ultrasound (limited) and breast ultrasound (complete). The bundled payment has updated, reflecting the change in services offered. 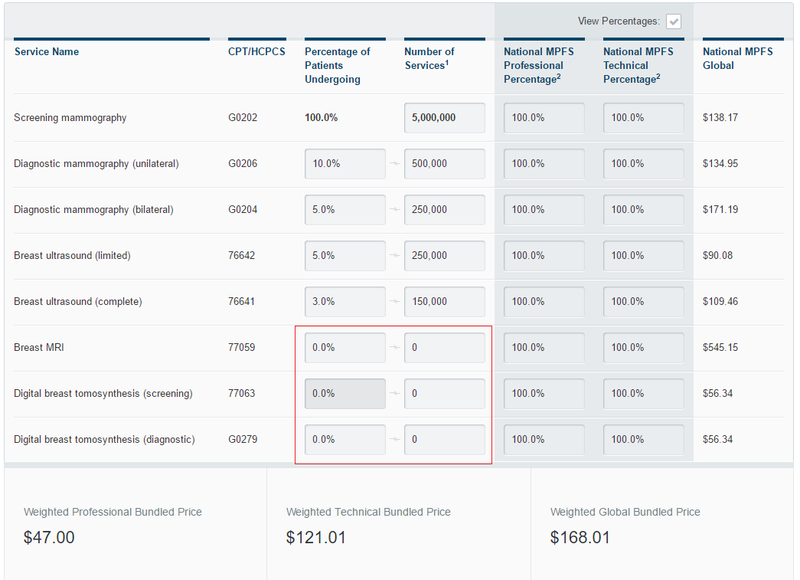 The services with percentage values of zero in the table may be offered separately but are not included in the bundle or bundled payment. For more information on how bundled payments work, you can see our Tutorial for the Inpatient Cost Evaluation Tool.